Tales of the Elsmo Four: A Towering Man. Finn was still in diapers when we started taking our family vacations in Door County. 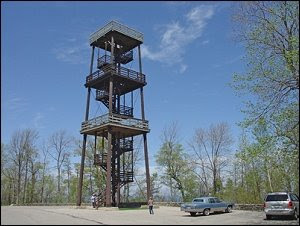 Leif and I had been together for nearly six years when we climbed the tower in Peninsula State Park for the first time. I grew up climbing the 75' wooden tower and never gave it a second thought. The tower is there and you climb it. thoughts of the tower collapsing among others. It was on top of that tower I learned my husband has a complete and total fear of free standing wooden structures. He feels every subtle movement, hears every creak, and cannot bear to witness children (especially his own) climb those dangerous stairs. Learning about Leif's unique fear was one of the strangest discoveries of my married life. Not to mention, it was quite the ordeal getting him down the stairs after he had gone up. 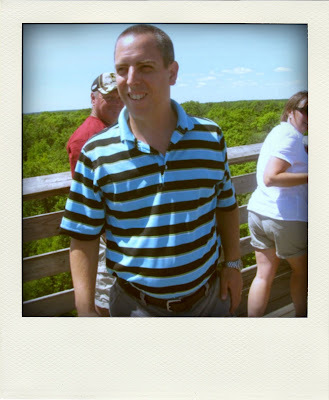 Each year following Leif would wait at the bottom of the tower while the kids and I climbed up. We'd wave, Leif would avert his eyes, and we'd come down. Not so this year folks. Fresh off a manly bed repair, my Leifer climbed that tower. Once he reached to top we asked, "Are you okay?" Leif responded, "No. I mean yes. I gotta go." After the kids and I made our way down we told Leif how proud we were of him and he responded..."secretly, I loved the rush." Mr. Fix It and an adrenaline junkie...what could be next?